How do I translate a search and article in JEWL? - Ask Us! Q. How do I translate a search and article in JEWL? Any EBSCO database from the Walker Library collection has two translation features. ​In addition, there is a "Listen" option - hear the HTML (full text) of an article read to you OR download it as an MP3 file. The language selection feature is located on the top toolbar. Hover your pointer over Languages on the top toolbar. 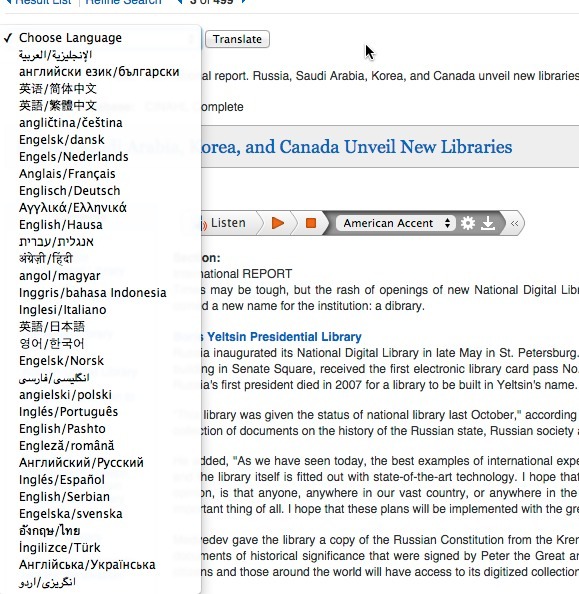 The drop-down menu of available languages appears. Select by clicking on the desired language in the list. The interface is translated into the selected language. How to make the database translate an article? Important: the translation is available ONLY for articles in HTML format (not PDF). It is an automatic translation, focusing on words rather than sentences. It is neither gramatically nor stylistically correct. It will help you to understand a text that contains many unfamiliar words (e.g. scholarly articles that often use jargon). Scroll down to "To translate the full text of an article"